"Finally... The Information You Need To Choose Your Synthetic Motor Oil and Prevent An Oil Sludge Catastrophe From Welding Your Pistons To Your Cylinder Walls and Throwing A Piston Rod Through Your Engine Block..."
Have you ever struggled with finding the right synthetic motor oil for your car or truck? Be honest with me here. ... have you ever been frustrated when trying to find a high performance synthetic oil that you can actually trust...? ... have you ever had an expensive engine that you wanted to protect for at least 300,000 miles but couldn't tell which oil would actually protect you? ... have you ever been disappointed because you pulled out in traffic expecting to speed up and stay ahead of the oncoming cars only to find your engine didn't have the same power it used to? ... have you ever been looking for information on who makes the best motor oil for your car or truck only to find yourself red in the face because all the "information" is published by the fat cat oil companies trying to get you to buy their oil? ... have you ever worried about the oil sludge building up in the bottom of your engine? ... have you ever wondered if the oil additives being sold at the counter of the auto parts store will actually erase friction from the inside of your engine or instead pollute your oil and create internal damage? You know I think I'm a lot like you. I want to prevent sludge and varnish from forming in my engine... creating hot spots...robbing me of horsepower. And I want to keep grit, dirt, and metal shavings from getting past my oil filter and destroying my cylinder walls and my valve seats and scoring all the other intricate running surfaces. You and I both know that keeping your engine clean and friction free inside is critical if you want to keep your engine running like new for a long time. That starts with proper oil change maintenance. I might be a little crazy but every time I start my engine I listen carefully for any new ticking sounds or other abnormal noises coming from under the hood. I think it just means my engine maintenance is important to me. That may be pipe dream but I was motivated by my new truck to find some real answers. That is why 8 years ago I took on a life changing search for a synthetic motor oil and filter. An oil and filter with a remarkable reputation I could trust long term to protect my brand new engine. I have to say it was quite frustrating trying to find non biased information that could be trusted. I know as an engineer I may dig a little deeper into technical problems and create my own trust issues but maybe my mental challenge is your gain! Question #1 Does synthetic oil better protect my engine from metal to metal wear, acid attack, sludge formation, varnish and all the other power robbing ailments of an aging performance engine? If so do all synthetics offer the same protection? Question #2 Does synthetic oil reduce friction and in turn increase horsepower output and improve gas mileage as compared to conventional? Can you prove it? Question #3 If I am going to spend extra money on a premium synthetic oil can someone (who is smart) please tell me exactly how long I can use the oil and still have the safe premium engine protection... and am I getting the best bang for my buck? When I started looking I couldn't find much hard data and test information to tell me what was good and what wasn't. Again as an engineer I wanted some real proof not just fancy rhetoric from snappy looking commercials. Real PROOF! Why would I pay attention to this? As an engineer ASTM is the holy grail of standardization and testing. When a test is completed per ASTM standards you know you have something credible.... and AMSOIL corporate went the extra mile to prove once and for all what they have known since 1972. The" four ball wear test" is a great way to separate the men from the boys. This is where the lab will press and spin a metal ball down into three other balls arranged in a triangle. The better the oil protects the less damage that happens. This is similar to a lot of the areas in your engine where there is a metal to metal interface like between a pushrod and a cam shaft or a piston ring and a piston wall. As you can see all the way to the left on the chart AMSOIL with the smallest wear scar at 0.35. This is telling us that AMSOIL does a better job of preventing your cam shaft from scoring and your rod bearings from scrapping themselves. The smaller the number is the better the oil protects and AMSOIL stands out in the results with the smallest wear scar. This is great for protecting your engine from metal to metal contact. 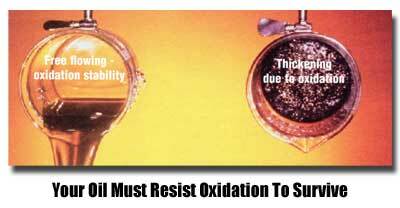 An oil is worthless if it doesn't hold its lubricating properties after it has been in use in an engine. What I mean is if after only 1,000 miles in your engine it is already broken down and is too thin to keep to prevent engine parts from rubbing metal to metal on each other under heavy acceleration... then we have a problem. On the other hand the oil could have oxidized and become too thick acting like a completely different viscosity grade oil then the one put in on day one... your engine could be sacrificed. 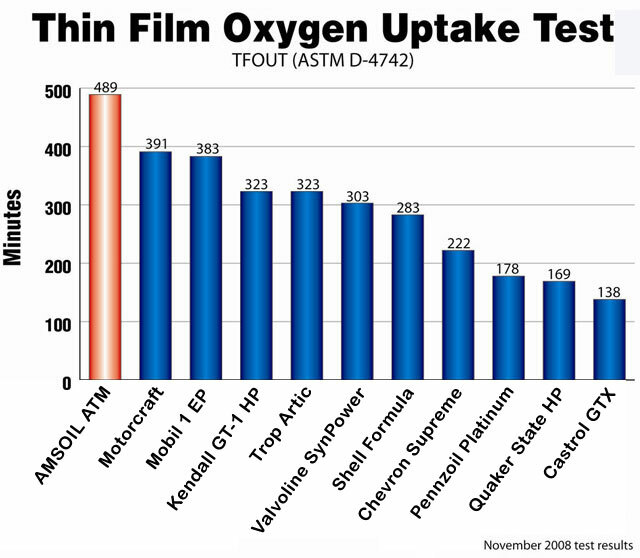 The thin film oxygen uptake test in an ASTM test shows how well the oil is going to resist breakdown in the hot acidic environment inside your engine. The higher the number the better in this test. Another win for your engine with AMSOIL at the longest duration. 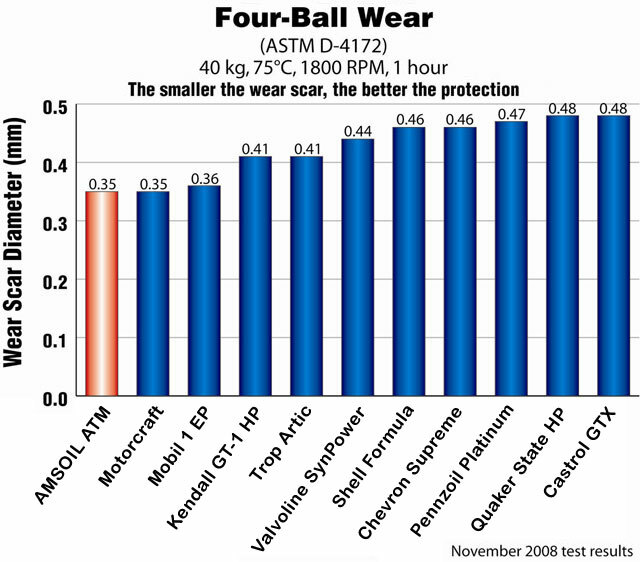 You can see that AMSOIL outperforms a number of other very popular brands by a factor of 2 or more. This means your engine will have almost the same protection in 3 months as it had the first day you put the oil in your engine... in fact field experience has shown AMSOIL to provide better protection at one year than most oils do at 2 months of use. The movies have done a great job of showing how strong acids will eat through human flesh and burn their way through metal decked floors... though a bit exaggerated in the movies, acids do pose a deadly serious threat to your engine. So an essential key to an oils ability to protect your engine for the long haul is its capability to neutralize and absorb acids that are produced from burning fuel in the cylinders. The TBN number indicates how much acid an oil can take before it runs out neutralizing power to protect your engine from rusting on the inside. In this test the higher number represents a stronger oil. 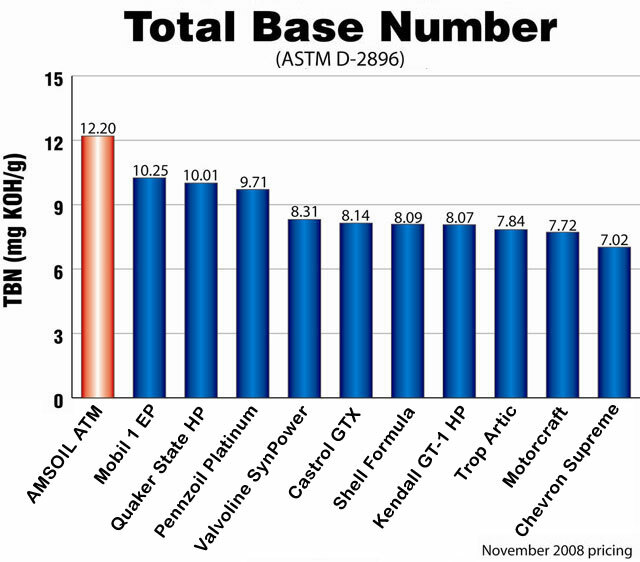 As you can see AMSOIL has a very strong TBN number, ranking the highest of all the oil tested, so you can count on AMSOIL for protecting your engine from acid attack and corrosion especially on extended oil change intervals. AMSOIL is the only company that has published third party test lab data like this and the only company that clearly states how long to use your oil between oil changes covered with an engine warranty (explained further below). A motor oil is only as strong as its weakest link... if it has great wear protection to start with but low TBN then you have good wear protection for a very short period of time cause the engine environment breaks down and goes acid... and that is when the metal pitting starts! Another example is if you have high TBN for long engine corrosion protection but weak 4 ball wear test results then you end up with engine wear but no rusting... still a bad choice. Your oil has to be strong in all aspects to be capable of preventing engine damage and it is a difficult balancing act for the R&D department to maintain... but AMSOIL has achieved an excellent balance and provides the proof to show it. I have been using AMSOIL for 9 years now and it saved my engine. I got a pin hole in my radiator which drained (sprayed) out while my wife was driving and she didn't notice. With no coolant in the engine the temperature sensor was not reading correctly so the engine endured 20 miles with no coolant. I started telling some of my engineer friends about AMSOIL... ouch! Talk about disbelief! The disbelief and criticism from my fellow engineers was down right hurtful at first... until they looked at the ASTM testing results. An engineer can not turn away from ASTM test data... you might say its like a moth drawn to a flame. So it is not insignificant that many of my personal engineer friends have converted over to using AMSOIL after reviewing all of the evidence. Stubborn Engineer #1 Tim C won't trust his engines to any "oil change place" now with all the problems he has had with cross threaded and incorrectly sized engine oil plugs. It is belly busting hilarious when he tells his stories of oil change misfortune with how many times they have screwed up his oil plugs (even though he doesn't think it is funny). He changes his own oil now and he converted to AMSOIL and decided to go to once a year oil changes on his Honda Accord and Honda Oddessy. Stubborn Engineer #2 Andy N grew up on the farm and has always changed his own oil. He has been using AMSOIL one year oil changes for the last 7 years on his Chevy 4x4 pickup. He bought his truck new off the dealer lot and takes great care of his truck (you would think it was his baby). Still looks new... like the day he bought it. Stubborn Engineer #3 Tim B changed from Mobil 1 synthetic to AMSOIL. At the time he changed to AMSOIL he had been changing Mobil 1 Super Syn every 5,000 miles in both his cars and was dead set against extending his drain intervals... but that was 7 years ago. Now Tim changes his oil once a year. Stubborn Engineer #4 Dave W still pays someone to change his oil but he loves that it is only once a year. He has been using it in his Jeep for the last 7 years. He is lazy and admits sometimes he goes two years without changing his oil... I do not recommend that! But it indicative of the quality of AMSOIL since his Jeep is doing great anyway. Stubborn Engineer #5 Morgen drives diesel pickup trucks and uses 13 quarts of diesel motor oil every oil change. Morgen used to change the oil religiously at a fixed interval of 5,000 miles. Now he uses Oil Analyzers Lab from AMSOIL to test his oil. He gets to confirm his engine is not wearing out and confirm how long he can wait to change the oil. Tens of thousands of trouble free miles between oil changes the last I talked to him. Stubborn Engineer #6 Engineer Mark S added the bypass filter on top of converting over to AMSOIL synthetic motor oil. He changes his oil once a year and with the extra bypass filter his oil stays really clean. I share these stories with you because the fact that so many mechanical engineers have converted over to AMSOIL to me is solid evidence of the quality of AMSOIL. Cooler operation by clearing out clogged ducts and ports in the intricate areas of your engine revitalizing engine cooling and performance. It's like curing heart disease for your engine. Avoid oil change disasters at your local quick lube. Let the oil tech cross thread the oil plug on someone else's Corvette. 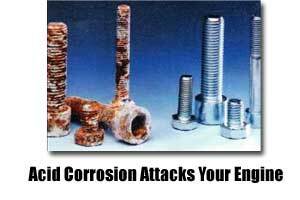 Prevent oxidation oil sludge damage while changing your oil half as many times as you do now. AMSOIL provides a complete protection and performance package in one bottle so you sidestep oil additive scams and rip-offs that cost Americans hundreds if not thousands of dollars a year. Remove varnish build up! Conventional oils can varnish up the insides of your engine. Engine flush and AMSOIL synthetic motor oil literally clean that back out of your engine... and keep it clean. General Motors has indisputable proof that most engine damage happens in the 5-15 micron particle size range so you can have expert confidence of the extra protection for your engine with a nano fiber filter that scrubs those particles out! PUMP UP your horsepower! Friction is the #1 enemy of your engines power and performance, cut friction to increase horsepower at the wheels using the uniform base blend of PAO in AMSOIL synthetic oil. Invigorate your throttle response! A clean engine gives you a clean throttle response to dominate traffic when you are merging on the freeway. As you can see... this synthetic motor oil is no ordinary oil and its a powerhouse of priceless technology. I can't tell you how excited I am to bring this cutting-edge technology to you. AMSOIL was created by the determined efforts of an award winning 25 year U.S. jet fighter pilot... Lieutenant Colonel Al Amatuzio. He recognized the extreme conditions that synthetic lubricating oils in his fighter jet engines had to endure and sought to bring the same benefits to the automotive engine. From 120F desert heat on the Tarmac to negative -47F at 30,000ft altitude (and colder) synthetic oils had already proven themselves superior and essential for the protection of multimillion dollar and powerful jet engines traveling at supersonic speeds. So in 1963 he started to assemble a team of chemists, the foremost experts in the lubricant industry, to adapt the synthetic oil technology from fighter jet engines to automotive and truck engines. His intense research and development started in 1963 and the first commercially available synthetic oil came to market in 1966... then by 1972 AMSOIL was the first synthetic motor oil in the world to meet the American Petroleum Institute's service requirements and then set all new standards for motor oil quality. AMSOIL was the documented first synthetic motor oil that out performed conventional motor oils on all counts. In fact, AMSOIL has since defended their title and won in court the right to call themselves the "first in synthetics". The same culture of industry experts working together to continue to pioneer and innovate engine oil technology... pushing the envelope every year to continue to create new and improved synthetic oils. And yes, Lieutenant Colonel Al Amatuzio is still there today demanding excellence from his teams! Every other major manufacturer has since recognized the superior capabilities of synthetic oils and has brought their own oils to market... but none compare to AMSOIL. AMSOIL continues to lead the industry with the unique experience and technical know-how to develop new and improved synthetic oils year over year... as all the test results and field tests reveal. AMSOIL is not a fly by night oil company... AMSOIL has been selling premium synthetic motor oil since 1972 with a 25,000 mile one year option that includes an engine warranty... you tell me how a company like that can stay in business for that long if their product doesn't do what it says. AMSOIL is not some highly refined conventional oil prettied up with a bottle label that says "synthetic" on it. Look for only the oils made with PAO basestocks... the original and true synthetic motor oil like AMSOIL. AMSOIL is not going to add 50 horsepower and improve gas mileage from 18MPG to 28MPG. Nothing will do both of those things that much and together (though a supercharger will help with the first!). How Can You Know If AMSOIL Is For You? If you are perfectly happy with the oil you are using and perfectly happy with the results you have had and perfectly happy with spending too much money and getting too much engine wear then AMSOIL synthetic motor oils and filters are not for you. If you really don't care that much about taking care of your engine and your going to sell your car before you hit 36,000 miles then this is probably not for you. If you like sitting and reading magazines in the waiting room of your local Jiffy lube and you look forward to doing this every 3 months so you can flirt with the cute attendant then this is probably not for you. If you are perfectly happy changing your oil every 3,000 miles and you want to do that 81 times over the life of your vehicle and spend $1,480 dollars for conventional oil vs $523 dollars for synthetic oil then this might not be for you. Read through the list below… and if you find that you have experienced ANY ONE of these problems, I highly recommend you grab this free offer now. If you drive 25,000 miles or more a year and end up changing your oil every 1-2 months then you need an oil with an engine protection guarantee at extended change intervals to assure your engine is protected while minimizing the time and money you spend changing your oil. If you are looking for the absolute premium protection for your engine and your looking to keep your engine as new as possible inside while maintaining the horsepower output and improving fuel mileage as it ages then this oil is for you. If you know changing your own oil is the right thing to do and keeping your oil clean is the right thing to do and you know that motor oil does wear out and you get what you pay for then this is the right oil for you. If you have a fleet of vehicles and you are spending a small fortune maintaining your fleet you can improve the fuel economy of the fleet, reduce the man hours required to maintain the fleet, and extend the life of all your fleet vehicles years if needed. I don't need to tell you whether or not you need AMSOIL. If you need it, you already know it. Before you decide whether or not AMSOIL is for you... I want to tell you why it's DIFFERENT from everything else you can pour into your engine. AMSOIL is the only motor oil that tells you exactly how long your extended oil change can be... 25,000 miles and with an engine warranty. AMSOIL knows what their oils can do. They have been field tested for over three decades to provide years and years of trouble free service at 25,000 mile oil change intervals. I know this is a shocking revelation if you have never heard of AMSOIL before today and it is hard to understand why you have never heard of this before. This is such a huge leap in technology that it is hard to believe unless you hear it from your brother who has been changing his oil once a year for the last 7 years and is still driving the same car with 178,000 miles on it. Why don't other companies have extended change intervals and offer engine guarantees like AMSOIL? Two reasons... because they have not cracked the code on formulating oil capable of doing this and... because it is a frightening business decision to put your money where your mouth is and offer an engine guarantee at any change interval. It takes an absolutely solid synthetic oil design to provide the protection and life that AMSOIL does and after 38 years no other company has stepped up to the plate and offered an oil that performs this well, this long, at this value. This is what really comes down to with a motor oil. You can have PAO basestocks, shear stable VI improvers, and all the other magical ingredients that go into an oil but if it doesn't protect then ingredients don't matter. Publishing test data of other billion dollar oil companies products is a brave move... it opens AMSOIL up for all kinds of evil law suits and attacks from huge corporations with deep pockets to pay their staff lawyers. But... this ballsy move works because the testing is third party and performed to nationally recognized ASTM standards. The test results are real and do not lie. If there is any challenge of the results the tests can be repeated by another third party lab. When you publish the truth and the truth can be repeated then it is difficult for a large motor oil company with evil intentions to win a court case against AMSOIL and the truth. Again AMSOIL has to be strong and ready to beat the lawyers away with a big stick... and that big stick is an honest synthetic motor oil product... with an honest marketing plan... and enough money stashed so the big boy motor oil companies can just drown them out in court by running them out of money. I shouldn't have to say it but only one company can be the first to bring a new and revolutionary product to market and AMSOIL did it in 1972. They were first and defended it in court and won. AMSOIL on the other hand has raised the bar again for an entire industry by providing an oil filter that uses nano technology to increase the dirt holding capacity and to filter smaller and finer particles out of your oil to eradicate engine damage that comes from particles in the 5-15 micron range. This may sound simple or even abstract but let me just say as an engineer these filter improvements are no small accomplishment, in fact it borders on amazing when you consider the filters are the same size as the OEM filters. This is what separates the men from the boys right here. Either the synthetic motor oil has money invested in making it the best possible lubricant and uses a group IV PAO basestock or it doesn't. Prior to that judges ruling only real synthetic group IV basestocks could be called "synthetic" oils (PAO oils are in the group IV category). Now, all of the sudden, all the motor oil companies using a conventional group III basestock got to call their oils synthetics... and jump on the bandwagon they did. AMSOIL spent decades building a solid reputation for synthetic oils vs conventional oils and then some judge comes along and redefines what "synthetic oil" is so that group III conventional oils could now be called synthetic. So look for "PAO". There is only one other company that has a popular PAO based oil that I know of and they don't go the extra mile with the additives to make the oil really superior. But because AMSOIL is free of this influence and can spend all they want on research and development, and on premium additives to blend with the oil, and on the best PAO basestocks they produce an oil that saves money for their customers and provides the best anti wear engine protection possible with out the bean counter accountants forcing them to cheapen there best oils. Now don't get me wrong... any large company that is going to stay in business for 38 years, public or private, has to run a tight ship... I'm just saying that no one can have two masters, customers and shareholders at the same time, and serve them both as best as they deserve. Your engine protection and performance are number one to AMSOIL... not some corporate shareholders or fat cat wall street brokers. No, you don't see AMSOIL plastered across a bunch of NASCAR hoods (even though a bunch of them are using AMSOIL under their hoods!). AMSOIL offers a warranty that covers the cost of repair or replacement of a proven mechanically sound engine damaged as a result of using AMSOIL synthetic motor oil. However, it has never happened. Decades of experience proves AMSOIL can be installed in any vehicle with complete confidence. Can you find that somewhere else? No. The biggest parts of gas mileage in the city have to do with vehicle weight and engine size. On the highway wind resistance steals most of your fuel economy. A small portion of gas mileage can be improved by reducing engine friction and oil flow resistance and drive train friction. AMSOIL performed a series of tests with a closed loop course and an 18 wheeler and demonstrated that an 18 wheeler completely converted to AMSOIL from the engine all the way through the drive train improved fuel economy 8%. Here's an example of what your fuel savings would be with an 8% improvement in fuel economy. Say you drive 20,000 miles in one year and you average 18 miles per gallon... that means you burned 1,112 gallons of gasoline. 8% savings would amount to 89 gallons of fuel! Let's say that gas is $2.80 a gallon... 89 gallons of fuel saved means you saved $249. If you only drive 10,000 miles in a year it would still save you $125. Is The Safety Of Your Engine Worth One Penny For Every 5 Miles? So what does it cost to protect your engine the right way? Is it worth 1/5 of 1 cent per mile to have the best filter and the best synthetic motor oil in your engine. That is 2 tenths of one penny per mile... 2/10 of one penny. You have to drive 100 miles for it to almost be one U.S. quarter to protect your engine. Would you drop a quarter into a coffee can every hundred miles if you knew it guaranteed your engine would last forever? It does not make any sense to me that people try to save a few pennies per every hundred miles by using cheap motor oil and cheap oil filters when the have thousands of dollars at stake in engine repair costs. How Do You Get AMSOIL? AMSOIL is shipped directly to your house... and with that they avoid the pressure to compete only on price. AMSOIL focuses on providing the best protection at the best value. You get the most bang for your buck using AMSOIL. After you call the toll free phone number and tell one of our friendly gals what oil and filter you need, your stuff shows up two days later. You can order on line too, just add what you need to your on line shopping cart, input your preferred customer savings number, get 25% off retail, then your oil and filters show up a couple of days later. Why is this the best way to get your oil? Having a store front or place of business costs money... its overhead. AMSOIL is a direct marketing company that manufactures and bottles the oil in Superior Wisconsin and then stocks the oil and filters in bulk at regional warehouses across the country. So instead of spending extra money to ship to local middle man they drop ship it straight to you... this is very convenient... my orders almost always show up at my house in two days or less (and sometimes as fast as the next day). Rarely do you find AMSOIL carried at your local stores so the fastest and easiest way to get it is to order on line (or call the toll free number). You can buy AMSOIL at retail price or you can buy AMSOIL at wholesale cost... If you have more than one vehicle then it makes sense to join the preferred customer program and save 20-25% on your orders. A 6 month trial preferred customer membership (as you can see here AMSOIL preferred customer program). The "Starter Pack" of catalogs, price sheets, and color comparison charts with your specific on line ordering and toll free ordering instructions. World class technical support to answer your questions on what oil and filters to use on your cars, trucks, ATVs, boats, and power equipment. Why am I offering this? Because we have not had the chance to meet face to face and because it is so difficult to trust anyone these days especially over the Internet, I want to make it as easy as possible for you to take a serious look at AMSOIL and see for yourself how well it will protect your engine. Years ago I found AMSOIL on the Internet and I requested information online and I received a package in the mail that answered my questions and helped me choose the best oil for my vehicles... and I want the same for you. I'm also doing this for you because I have 100% confidence that AMSOIL is going to give you the best engine protection available while saving you money. I know that after you put AMSOIL in your engine the confidence you have that your engine is protected you will be so pleased that you will never look back. AMSOIL is the best way to get started reducing your engine oil sludge risk, reducing engine wear and improving your horsepower over the next 20 years. #1 Click on the SIGNUP NOW button below. #2 Follow the link to our online shopping cart. #3 Select the 6-Month Trial and then Add To Cart. #4 Click the Proceed to Checkout button. #5 Click the Create An Account button. Your account is set up immediately and you get your preferred customer access number. At the same time a starter package will be shipped to your home. You can order online and get your discount as soon as you receive your new account number online or you can wait for you starter package to arrive in the mail in a few days. So go ahead and click the SIGNUP NOW button below and provide your name, your shipping address, your phone number, and your email address and get your trial preferred membership so you get wholesale pricing on all the AMSOIL oil and filters for your cars and trucks. The starter package is risk free to you in this limited offer whether you decide to order oil or not. There is absolutely no risk to you... get the starter kit and discount before they decide to take this offer down. Click the SIGNUP NOW button and fill in your name, the address to ship the starter package to, and your phone number and your package can drop in the mail right away. So go ahead and click the signup now button to order your starter package of catalogs and wholesale price lists in the mail which save you 20-25% over the retail price when you order your synthetic motor oil and nano fiber oil filters. The starter package is risk free to you in this limited offer whether you decide to order oil or not. There is absolutely no risk to you... get the starter kit and discount before they decide to take this limited offer down. This is the best decision you have ever made for the protection and performance of your engine. Do you know that feeling you get after you just poured 5 or 6 quarts of clean and new motor oil into your engine at the end of an oil change... and when you start your engine for the first time after an oil change you know that clean amber colored oil is pumping up through your engine, protecting it! Now put your information in the box, press the submit button and get your risk free, no obligation information packet mailed directly to you right now. P.S. I know there was a lot to swallow in this letter but the bottom line is if you want to keep the inside of your engine looking clean and new so that your throttle response is strong and you get the engine life you deserve then you owe it to yourself to go ahead and request the preferred customer starter pack that gives you 20-25% off on all AMSOIL products. This is usually $20 dollars for the full membership but you get a significant discount with a limited trial membership if you go ahead and sign up right now. So don't decide now just go ahead and get your risk free starter kit so you can have a closer look at the AMSOIL product line and the discounted prices. Go do it right now. Dealer Marc Haibeck of Addison, Ill., near Chicago, services high performance Corvette ZR-1 engines exclusively at his shop, Haibeck Automotive Technology. Haibeck became interested in AMSOIL 10W-40 Synthetic Premium Protection Motor Oil (AMO) when he learned it is specifically designed to meet the needs of car engines with flat tappets, such as those in the ZR-1 engines. “That applies to the ’60s muscle cars as well. The high-performance engines can’t use today’s oils,” he said. “I was happy to discover that AMSOIL provides a quality product based on the engineering requirements rather than the marketing requirements of some other motor oils,” Haibeck said. AMSOIL customer Gene Sandberg moved to Smolan, Kan., about nine years ago and took a job that required an 85-mile one-way commute. “I purchased a used Pontiac Grand Prix with 30,000 miles on it to use for the drive,” said Sandberg. “With nine years to retirement, I figured I would go through at least three cars in that time.” Sandberg mentioned to a friend at work that he was constantly having to change oil since he was putting so many miles on his car. His friend suggested switching to AMSOIL and mentioned that his father was a distributor. “I took his suggestion and started using AMSOIL. The car had about 70,000 miles at that time,” said Sandberg. Sandberg admitted that he doesn’t always follow a scheduled maintenance routine as well as he should and usually went at least 30,000 miles before changing oil, sometimes without changing the filter between intervals. 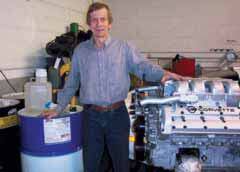 Now he buys AMSOIL Series 2000 0W-30 Motor Oil and AMSOIL filters from Dealer David Geist. “I retire in another month and the Grand Prix is still running,” said Sandberg. The car has accumulated 358,000 miles and has needed no engine work. “I just saw a commercial on T.V. for another brand of synthetic oil where the customer was pleased with her 150,000-or-so miles, and I just wanted to let you know I’m over twice as pleased as she was,” said Sandberg. Keith Jones of Pleasant Hope, Mo. 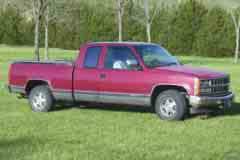 owns a 1989 Chevrolet 1500 pickup that has accumulated 613,707 miles. The truck was changed to AMSOIL 10W-40 Premium Protection Synthetic Motor Oil (AMO) when it had reached 30,000 miles. Since then, Jones has changed the oil and filter every 20,000 miles. He also greases the chassis with AMSOIL Synthetic Multi-Purpose Grease at 20,000-mile intervals. “The engine still has the original timing chain, gears and rocker gaskets and has no leaks anywhere,” said Jones. He said the chassis still has the original ball joints and tie rod ends, and they are still tight and serviceable. “I know that without the synthetic lubrication from AMSOIL I would not have gotten this kind of service from the truck,” said Jones. Preferred Customer Lyle Reinier from Mesa, Ariz. has been using AMSOIL products for four years with complete satisfaction. He said that when he started using them in his 2001 Dodge Ram they “changed the way it ran.” Now Reinier drives a 2004 Dodge Ram. He uses AMSOIL Synthetic 5W-30 in the engine, AMSOIL Synthetic Universal Automatic Transmission Fluid in the transmission and 80W-140 Long Life Gear Lube. “AMSOIL has given this truck life that it was hiding before,” said Reinier. Reinier said the Ram now pulls stronger and runs smoother than it did before. He made the switch to AMSOIL when the truck hit the 3,000-mile mark. “What comes as a surprise to me is that my Dodge dealer had no problem doing a complete drain and fill with AMSOIL,” said Reinier. Reinier said the dealer removed all the Dodge transmission fluid and refilled the truck with AMSOIL ATF. “Within a mile or two I could feel the transmission was smoother and showed a difference in how it performed,” said Reinier. Reinier also uses AMSOIL in his dirt bikes. He and his wife have been using AMSOIL 0W-40 Formula 4-Stroke since it was introduced. Within the last year, Reinier performed a big bore and a valve job on their bikes in search of more power. “The insides of the cases, transmission gears and crank shafts were all like brand-new,” said Reinier. Reinier said the cylinder walls of each bike still showed some cross hatching from the original bore. He also said the bikes run quieter, smoother and cooler than they did before the switch to AMSOIL. Both bikes have their original clutches and have logged over 4,000 trail miles. Keller Grain, Inc. in Castroville buys high quality white and yellow corn from local farmers and trucks it to processing plants across the state of Texas. The company has been in business since the 1960s. “These trucks put on about 12,000 miles a month,” said Burnell Keller, the company’s owner. Keller installed AMSOIL 15W-40 Heavy Duty Diesel and Marine Oil in his Freightliner, with more than 400,000 miles on the engine. The company decided on a routine of oil analysis and filter change at 15,000. "We did this procedure three times at a 15,000-mile analysis and filter change only," Keller said. "Each time the oil sample report came back saying the oil was good for continued use." Manager Michael Keller is in charge of making sure the trucks are in top shape when they get on the road. After the third round of analysis, the oil was changed. The company plans to continue with 15,000-mile analysis and filter changes and to continue to use the same oil for an interval of 50,000 miles. "That’s about five times longer than before," Keller said. "It’s very good. Keller Grain is now convinced that AMSOIL is a superior product and that anybody can save money using AMSOIL products." Where can I buy AMSOIL oil? Save 25% instantly by locating the best place to buy AMSOIL. Request a FREE full color catalog rushed to your door! Read why good synthetic motorcycle oil is the best protection for your 2 cycle or 4 stroke motorcycle. Looking for the ultimate synthetic oil for performance and protection! Look no further. Learn why good synthetic diesel oil provides superior protection for the biggest problem in diesel engine lubrication Soot! Save money with these gas mileage enhancer tips and products. Reduce your spending at the gas pump. There are many benefits of synthetic oil but the biggest benefit of synthetic oil is saving you time and money. Changing synthetic oil can be done less often than changing conventional petroleum oil - if the oil is properly designed. AMSOIL Synthetic motor oil protects your engines - read AMSOIL testimonials and see how satisfied our personal customers really are. Stop limited slip differential chatter with slip lock and AMSOIL gear lube! Stop limited slip differential chatter with slip lock and AMSOIL gear lube. Slip lock can be added to any differntial to help control chatter. You won't need any additives with AMSOIL gear lube. Cleaning engine oil sludge will improve engine performance and protection. AMSOIL engine flush provides the best cleaning of engine oil sludge and should be used before installing AMSOIL motor oils. AMSOIL produces the best ATV synthetic oil and synthetic snowmobile oils on the market. AMSOIL synthetic oils provide the best performance and protection for your ATV and snowmobile. Not the only home based business opportunity out there, but it does stand out as one that people are more likely to be successful at. Ordering Synthetic Motor Oil is easy - here's how! Ordering Synthetic Motor Oil is easy. There are many ways to get synthetic motor oil, and we explain the options for you. Many retail establishments are also Synthetic Motor Oil distributors. Check for a retail Synthetic Motor Oil distributor near you. Quick and informative review of synthetic motor oil's benefits over conventional oil. Identify a good oil with this synthetic oil review. V-Twins Run Cooler and Quieter with New AMSOIL 20W-50 synthetic v-twin motorcycle oil. No other oil protects motorcycle engines and transmissions better - whether on the road or in the garage. Get the shocking report on the motor oil you use in your engine. Is A Toilet Paper Oil Filter Worth Your Time? AMSOIL hydraulic oil with varnish control technology provides all season protection from start up to maximum temperatures. Discover the best protection for your high performance 2 stroke engine. Use synthetic 2 stroke oil to maintain peak performance and long life in your 2 cycle engines.